“Overshadowed”: the “Back To Mine” model taken literally, in a mixed-construction collage of music very personal to my existence; upheld as a return to being myself. Catalysed by an explosion of hateful bile, and inaccurate surmising, from two allies, towards me - defending the woman I’ve scripted in the “15 Minutes Of Fame” writeups from part 5 onwards - who this is anonymously dedicated to, each track signifies through titles a soundtrack to meetings, and departures which have never taken place. Cataloguing what can overshadow failed friendships by symbolism - from the rebuttal of society with “Untitled” by Klute, to the depth-charge fathomages - over fabrication - of Grouper’s “Close Cloak”, prior the stones of universal change, gathering moss, and returning with surplus details - from each rise and fade - on Ulrich Scnauss’ “Molfsee”; rain samples bespeaking the “Where are you going?” questioning in GYBE’s “Providence, then a handful of sentimental recordings from 2006, where I believed I could trust this lady - as a true friend; no infatuation, just investment by what I brought to the table in conversation; then finally the juxtaposing of rational and irrational lust, leaving the participant with a subconscious dialectic principle for advancement on “The Dialogue”, by Pilote. The end of a relationship or marriage can be a difficult and painful experience. It can leave you feeling confused, lonely and lacking confidence in yourself and the future. Feelings of betrayal, guilt or rejection are common. Anger, sadness and confusion are often intense. Moving forward can be hard when trust, self-confidence and self-esteem have been shaken. 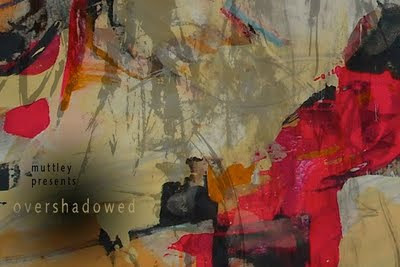 All I hope for is that “Overshadowed” can be an aural springboard to assist and heal those swathed in darkness, that which I’m slowly exiting, one step at a time.